This entry was posted in Aesthetics, Art, Blogging, Christian writing, Creativity, Drawing, Eco/Natural Dyeing and Printing, Printmaking, Science, spirituality, Walking, Walking Art, Writing and tagged Automatic Writing, Bhagavad Gita, Byzance, Calligraphy, Drawing, Frederick Franck, Graph Theory, Krsna, Leonhard Euler, Mark Making, meditation, Mobius Strip, Monocondyle, Paul Klee, Poetic Mapping, Rust Printing, Rust Printing on Silk, Seven Bridges of Konigsberg, Stéphanie Devaux Textus, Tommy Wasserman, Tomography, Topology, Upanishads, Zen. Bookmark the permalink. Nice to see that a blogpost of mine has inspired you! Thank you for commenting, Professor Wasserman! And for bringing me some illumination (no pun intended) on the subject of the monocondyle, which I find intriguing. I can find little on the Internet about it and mostly in French, curiously. The British Library has nothing, nor the British Museum. If you know of any books or even other articles on the subject, please let me know (English or French). I’m planning to do some artwork incorporating the monocondyle. I’ll probably use wax. There’s a French artist – Stephanie Delvaux – who has used it in some of her work. I came here from Petru’s blog. Interesting post. My mother was an artist and she didn’t mind when the four of us decorated every wall of the house up to as far as a four or five year old can reach. By five we were learning to stick to paper. I never went to art school but learned to draw and used to draw and paint for years until l started to write. I’ve not produced anything very attractive with the thumb joint writing, but I did try drawing without looking at the paper and got a result I am very pleased with—I know it’s my favourite dead tree even if thousands wouldn’t! You should post your monocondyles for us to see. Attractiveness is secondary. I will be ‘engaging’ with the form, probably in the New Year. I liked your ‘Etheree’. New word for me. Is it right you live in France? Lived there for 11 years. Much of what I’ve read about the monocondyle has been in French, strangely enough. There’s a French poet(ess) Tristan Felix – she does silent poetry readings and has run a workshop teaching the monocondyle – there’s a video on You Tube, if you’re interested. I will be doing more writing than just my blog in 2019. In relation to drawing, etc. Thanks for reading. The things that I tried were just pencil on white paper and I wouldn’t know how to post them, I’m technically challenged. I had a look at Tristan’s video and would have liked to have seen more of the results as I’m not clear what exactly they are doing. Calligraphy I love as an art form, so maybe I’m too structurist for this. I’ll read a bit more about it. I’ve probably missed the point somewhere. I have lived in France all my adult life. We’re in the Lot-et-Garonne, what used to be called la France profonde. Lots of trees to draw. Glad you liked the etheree. I have assumed part of the skill of the monocondyle would be due to its use with ink of some kind. In medieval times a common ink was ‘iron gall’. I plan on using inks or dyes made from matter from my own garden. Likely the results will be ‘unlovely’ physically, but maybe ‘metaphysically lovely’? Lot-et-Garonne. You will know the lovely Éléonore. And her troubadour Bernat. (I have some of his music). I wasn’t sure what Tristan was doing either – glad to know it wasn’t just my French! There are other videos in which she is ‘silently’ reciting poetry dressed as a ‘cloun’ with a picture frame round her face. Not a straightforward type in any language. Good luck. I’ll look in on your site from time to time. I’m still in a bit of chaos following the house move. An script ink painting would look attractive. The trouble with that vid was that the one example that was shown in detail looked like a mouse has run over the paper. It was pretty in a way, but it certainly wasn’t d’un seul trait which is presumably the basic idea. I’ll have to pinch me Eléonore’s inks (yes, I have an Eléonore) and give it a go. I saw the clown vid too. She has a nice voice. We don’t hear her silences though. The signature thing seems very French to me. No French person signs their name with recognisable letters. The more pretentious the squiggle the more self-important it shows you are. I like the idea that it started a thousand years ago and they still cling to the idea even it has been changed to one of simple showing off. We had our Eléonore (daughter not cat or budgie) before we even thought of coming to Aquitaine, but everybody thinks it was a premonition. It’s interesting that the majority of references in respect of the monocondyle, that I came across, were in French. I had no idea about any connection between the monocondyle and the ‘French signature’. I don’t know how far back the French obsession with illegible ‘marks’ to replace a legible signature goes. 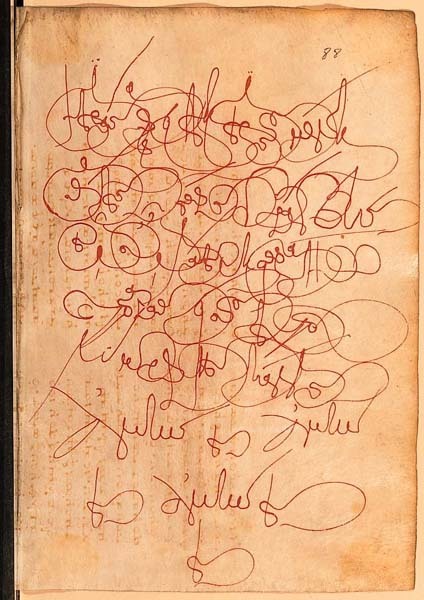 The 17th and 18th century writers all had legible signatures. It’s probably a much more modern attempt to stand out from the crowd. We had a plan (it was husband’s really and I thought why not) to come to France as soon as we finished at uni and we did. Not really a dream, more an inevitability. Well, France seems to suit you. Have a nice Christmas, Jane. ”Drawing made of me a problem to be solved by removing me from society.” – You made me laugh so hard! Even if it isn’t/wasn’t funny. Did you notice – the second drawing (not looking at the surface) contains an almost heart shape? I just mentioned on another blog about drawing without looking at the working surface. It was an exercise given us when I was at art school. The observation – really, really looking at what one is working from – is so valuable! I think I want to go back to drawing as well. Loved the ending of your post. Glad you are finding your feet in your new environment. Hi, your comment was sent to my spam for some reason! I was a wee small kid – just big enough to be drawing a skirting board level! – when I was banished to the bathroom. Hardly conscious, though I do recall a certain anxiety and I was cold! The pond’s artificial and kidney-shaped, though I could see that turned on its side the drawing may have bits of right and left ventricles … ! A sort of broken heart. Fits. You deserve a medal for ploughing through to the end of the blog. I had a message from WordPress recently ‘congratulating’ me on having blogged for 8 years. So I’ve been ‘stocktaking’ and I can say I’m really pleased I’ve done it. Talking to myself out loud. It’s painful and I feel naked. In my bed in the bath I sharpen my lethal crayons. While painting the kitchen I’ve been listening to back to back You Tube vids by Jordan B Peterson. I got so lost in them I found myself still painting the ceiling at 3am. I’ll pop by your site soon. I’m sure you were cold in the bath. And glad you kept sharpening your ‘lethal’ crayons. I’m surprised they didn’t take it away from you all together! Plunge some more Ann. Into ponds, into art into creativity into you. I burst out laughing at the picture of child, gloss paint and soot on the rug. But then swallowed it at your cold night without bed clothes. And I keep wondering about Ann walking into the pond in the night – I refuse to ask how come you didn’t realise at the first step into the water? I don’t want to know. I love the idea of you keeping on going in until you were waist deep. Suppose it only took a step or two as it isn’t such a large pond. I stood in the rain for a few seconds the other night. It was a blistering hot day and rain started falling, just a few drops far between and it was lovely! Didn’t get soaked though. I’ve confused you. Sorry. I didn’t walk in up to the waist (actually it’s hip deep). I only took two steps into it up to my ankles. The water soaked my pants up to my knees but at least I didn’t slip … I’ve a balance disorder (inner ear problem). Tests revealed I can’t maintain a straight line when I close my eyes and walk – I THINK I’m walking in a straight line, but I veer off. So in the pitch darkness I thought I was walking PAST the pond but was actually walking at it! Poor fish! The moral of the story? Take a torch! Doesn’t take much to confuse me I guess! I’m sure the fish are fine. Hopefully you didn’t catch anything? – obviously not the fish. Very interesting. Personally, I think the classical rules are valuable, and I wish I knew them better. But yours is a noble quest! Cheers! Thanks Bumba. You read quick! Thanks for Johnny and your Folsom. I’ve stopped the bleeding now. Tourniquet round the heart.